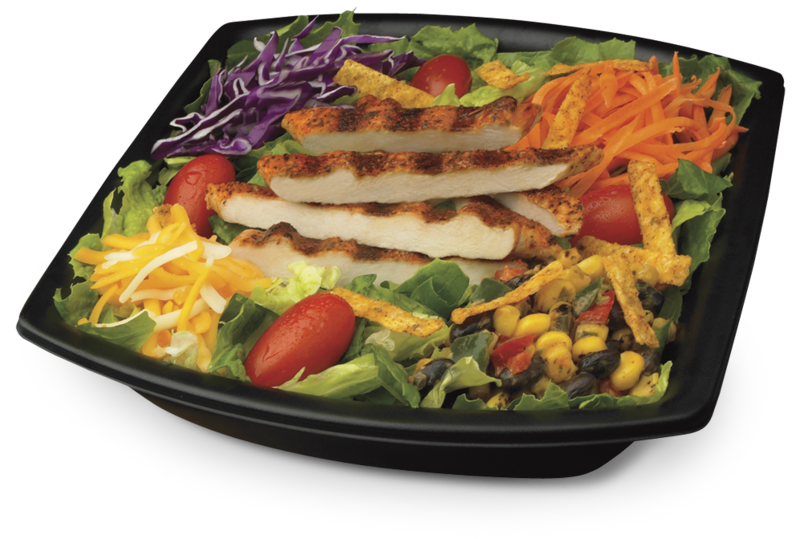 I went to a busy Chick-fil-A for lunch yesterday and had their Southwest Char-grilled Chicken Salad. Awesome! 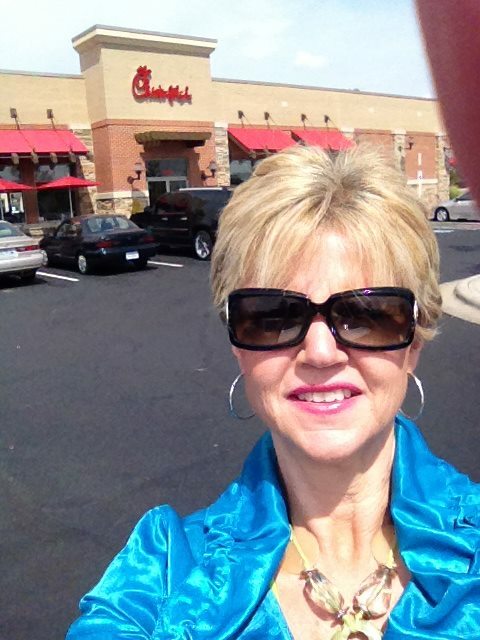 I have never been to Chick-fil-A before. We don’t have any around Central, Mo. However, there are some in the Greater KC area. This one is in Overland Park, KS. When you first walk in you are immediately offered ice water – really nice coming in from 100 degree heat. Also they are extremely fast but courteous. The other thing about eating there – that was the cleanest fast food restaurant (ffr) I have ever been to before. Traveling a lot takes me to more ffr’s than I care to share. Other nearby restaurants were not buzzing with the activity that Chick-fil-A was – with cars for drive-thru all the way out to the street. Another first…this restaurant has hostesses. Warm and friendly folks. That’s how I met Patty. Thanks Patty for visiting with me. You are a wonderful ambassador for Chick-fil-A. I’ll be back! 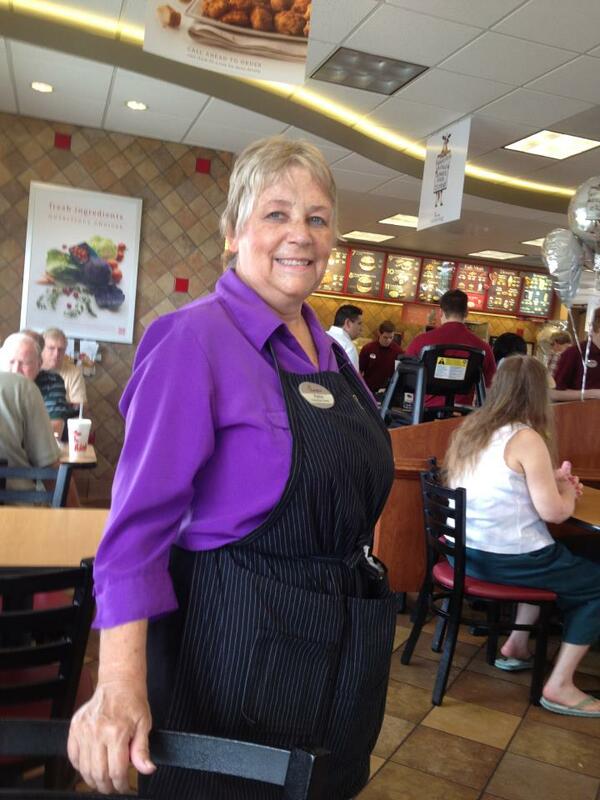 Patty is a wonderful hostess at Chick-fil-A in Overland Park. Learn more about Patty at her website http://www.pattysneighborhood.com. Today was my first long run in 2 weeks. The last one I did was 11 miles. 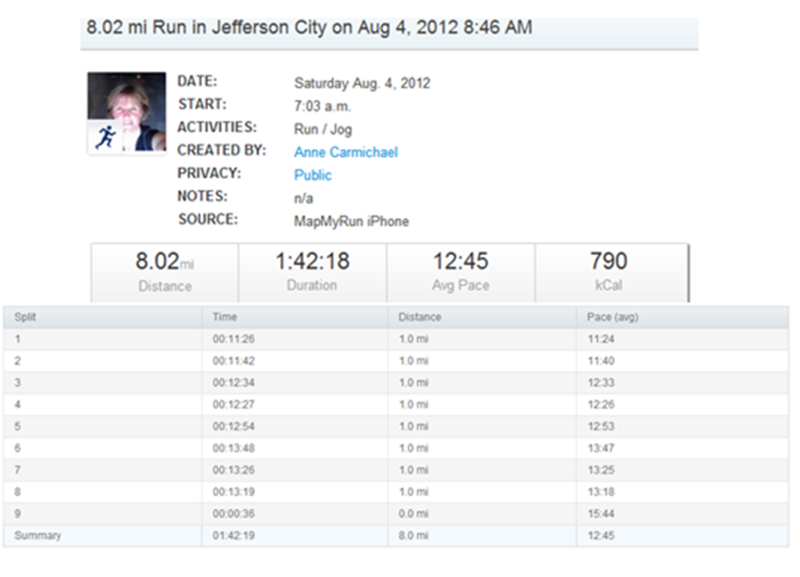 So as I ease back into running post respiratory illness, I thought it best to bring it down to 8 miles. Which I did and done! Ran it in my Vibram‘s too. I have been working at running on the balls of my feet which is necessary for “barefoot running.” I probably won’t be able to do the marathon in them but would sure like to. No bruised toes and feet generally recover easier. I also feel “light footed” when I run in them. I’m just glad I was able to get back to doing long runs. I have been coughing some since, but the humidity was 80% and it rained just enough to increase that a bit. Pollen is really bad right now too. There were other runners out but didn’t have any other LIFE Runners. I wore my shirt just in case. Early in morning on the weekend you can even run in the street which is nice. It’s okay as long as you are facing traffic :). It was a good run and I’m hoping after it cools off a bit I can get my speed up to averaging 10 minute miles instead of 12. Tomorrow at 5 am CST watch the 2012 Olympic Women’s Marathon Final. Can’t wait! I love all the track and field competitions. 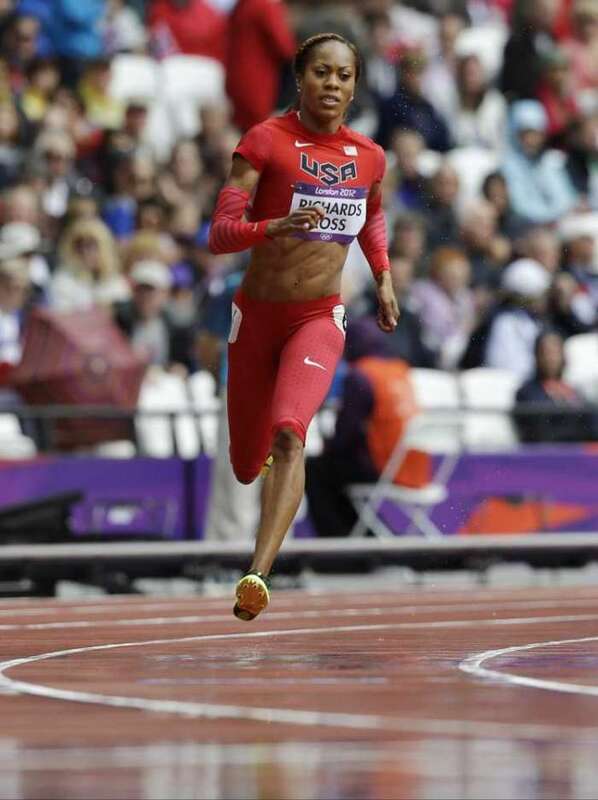 Yesterday I saw Sanya Richards-Ross win the 400 meter heat. Wow was she fast. There were several shots of her later that showed her actually in the air as she ran. I’d love to know what shoes those are she is wearing. They look like Nike with spikes. The sleeves are pretty cool too. Photo is courtesy of Ben Curtis, Associated Press. This entry was posted in Miscellaneous. Tagged 2012 Olympics, Associated Press, Ben Curtis, Chick, Chick Fil, Fast food restaurant, long run, Marathon, Nike, Running, Sanya Richards-Ross, Training, Vibram. Next Post Next post: 2012 Olympic Women’s Marathon is on!